Precise information on the material properties is essential for the dosing accuracy. As a rule, a material data sheet with all relevant data is provided for all liquids and pastes. Nevertheless – some information is not communicated or may vary. This is often the case for the density of the medium. However, for volumetric dosing the density is a particularly important parameter and not without reason. For a perfect dosing result a calibration of the dispenser is absolutely essential when operating. With the preeflow eco-PEN, it is possible to carry out a density measurement via the calibration. The basic setting of the preeflow controls is based on the density of water. 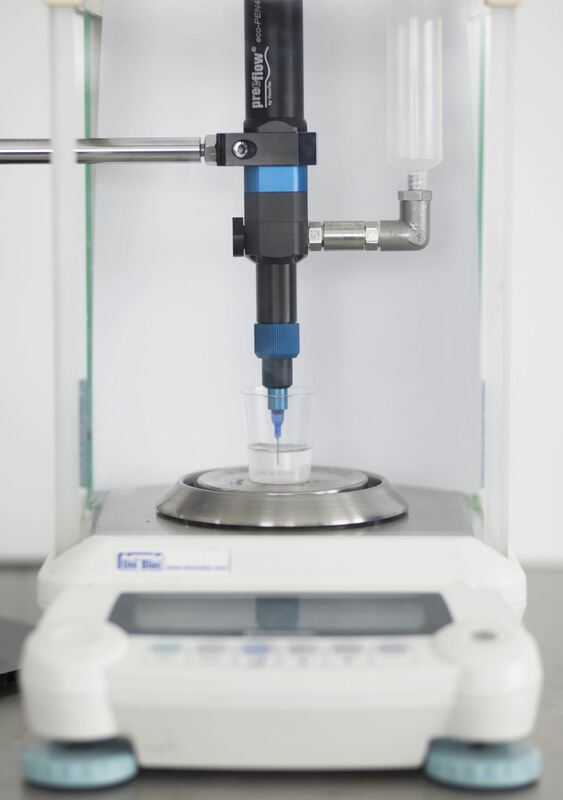 If you first measure according to the operating instructions in the presetting (water) and then control the dosing volume with high precision scales, a defined weight will be displayed. If you now change to the unknown medium and carry out a calibration again – without changing the density set for water – you get a different weight with a known volume. Using the formula for the density calculation (ρ = m / V) the density can be found. For the dosing process, the control must be calibrated again with the known “new” density. A precise and perfect dosage, also in the microliter range, that lets nothing get in the way.